[Modern & Unique] - Unique hollow design on top make this samll bathroom cabinet modern and fashion, not only for storage, but also for decoration of your room. [Space Saving] - This cabinet comes with 2 shelves and a paper towel layer, perfect storage solution for bathroom or bedroom. 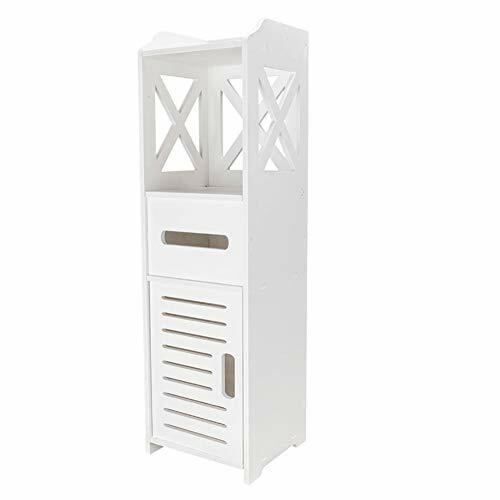 [Eco Friendly Material] - This compact bathroom furniture is made of wood plastic composite board which is eco friendly, sturdy, durable and anti-corrosion and waterproof, make your room neat and clean. [Compact & Lightweight] - With two tier design, you can put many items in it, like shampoo, body-wash, toilet paper, etc. Only 3100g weight, makes you can put it at anywhere you want at home. [Easy to Clean] - Wipe with a dry cloth, very easy to clean.